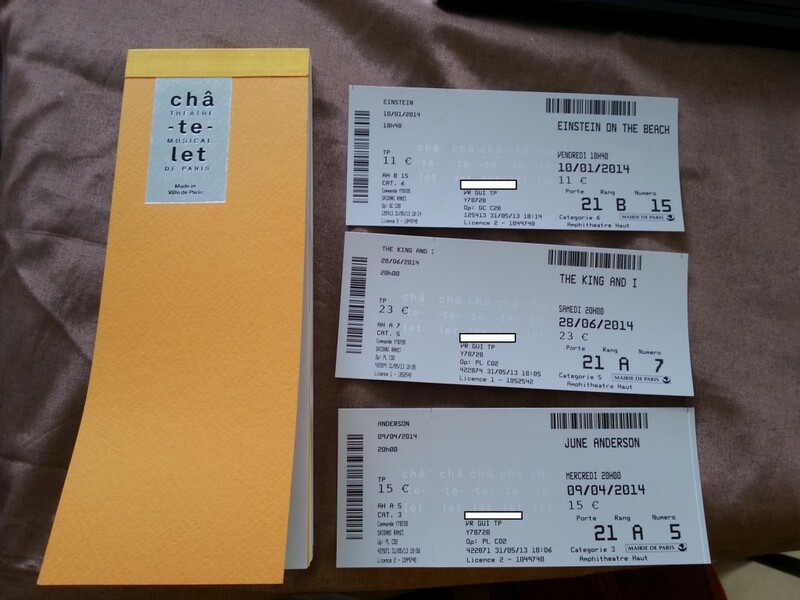 Some of you living in France may have received the new season brochure of the Théâtre du Châtelet. The Théâtre du Châtelet is one of the most important theatres in Paris. If you want to learn more about this magnifiscent Italian-style theatre located in the very centre of Paris, feel free to have a look on the Théâtre du Châtelet Wikipedia page. My first reaction was the brochure was quite unconventional because it shows very unusual dimensions : 8,5 cm of width & 21,9 cm of length. Therefore it is quite narrow and long. It is as if a regular A4 paper sheets was more or less split into 4 equally stripes. So this new season programme saves paper ! A good point for environment and perhaps a first step toward a zero paper season brochure ? Another point I noticed was its will to promote social networks in the paper brochure. 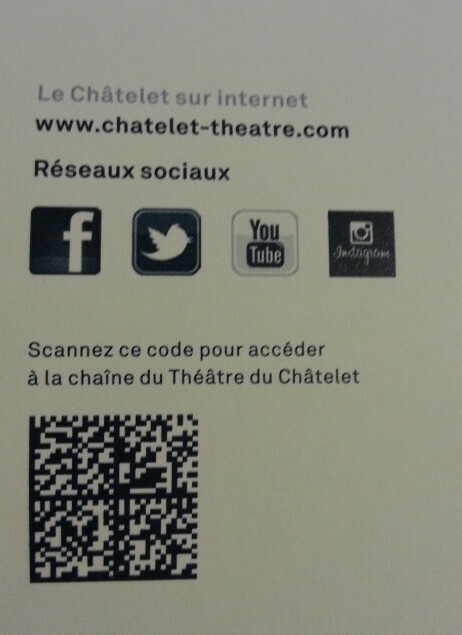 The Théâtre du Châtelet is present on several social networks : facebook, twitter, You tube and even Instagram. What particularly pleased me was the way the Theâtre du Châtelet communicates about its youtube channel using a QR code on page 101 of the brochure ! Some American Opera such as Florida Grand Opera had been using QR codes even on large billboard for years. However in France, amongst opera houses, it remains still quite rare to see a QR code or a flash code in a programme or in a billboard. So the Théâtre du Châtelet uses a QR code to get directly to the Youtube channel showing how important mobile phones have been used to watch videos ! More than 1 out 3 mobile phone owners watch videos on their handsets ! For those of you that don’t know what a QR code is, please read the Wikipedia article about that. In a nutshell a Quick Response Code is a kind of two-dimensional barcode which let user access a destination site without having to type manually a complicated and URL link in a his or her browser. The more common device to read QR codes is a smartphone. If your mobile handset is equipped with a dedicated application (for instance QR Droid, Mobiletag, QR reader, i-nigma etc…), it can scan, display the code and convert it to some useful form (such as a website url or an automatic launch of a video) ! To conclude, I hope it is the beginning of a more widespread usage of QR or flash codes in printed communication materials of French Opera houses ! Museums in France seem to lead the dance of digital for instance regarding NFC technologies. Opera houses and theatres have to follow ! “Some fresh air on 2013-2014 brochure of the Théâtre du Châtelet” by Ramzi SAIDANI in under terms and conditions of the licence Creative Commons Attribution 3.0 France. This entry was posted in Théâtre du Châtelet by Ramzi SAIDANI. Bookmark the permalink.